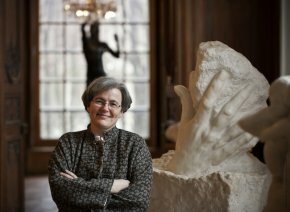 9/1/12 - Appointment - Paris, Musée Rodin - Currently Chief curator for heritage at the Musée d’Orsay, Catherine Chevillot has been appointed director of the Musée Rodin, replacing Dominique Viéville. After completing a DEA (a graduate degree) in contemporary and modern art history on Emmanuel Frémiet, Catherine Chevillot passed the competitive exams for curator and entered the Ecole Nationale du Patrimoine in 1986. From 1988 to 1990, she was a curator in Grenoble, deputy head of the museum, before coming to the Musée d’Orsay as curator specialized in sculpture between 1990 and 1996. After several years at the C2RMF (Centre de Restauration et de Recherche des Musées de France) directing the sculpture department, Catherine Chevillot returned to the Musée d’Orsay in 2003, where she has been chief curator for sculpture since 2008. The author of articles and essays devoted essentially to 19th century sculpture, she also curated (and co-curated) several exhibitions on this subject, notably the retrospectives on Emmanuel Frémiet (1988), Denys Puech (1992), François Pompon (1994), Préault (1997) and more recently Degas sculpteur in Roubaix (2010). Although we did not review the last one, we did however discuss on this site the large exhibition which took place in 2009 at the Musée d’Orsay, Oublier Rodin (see article in French) and the original project represented by the special-study exhibition held in 2010 with the students from the Ecole du Louvre, Tous collectionneurs ! Carpeaux et Dalou édités par la maison Susse (see news item of 28/6/10). A curator, specialized in 19th century sculpture, appointed head of the Musée Rodin...In today’s context, this is almost surprising information which deserves to be highly commended.